Mozzie rilascia GTA Pokemon, che come dice il nome, è un misto tra GTA e Pokemon. 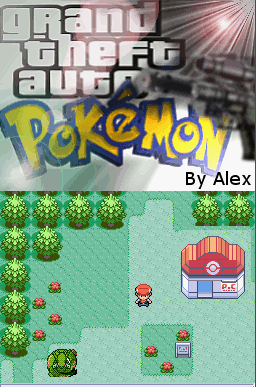 I Am Proud To Say that GTA Pokemon Is Now Complete. I Will Be Making Another One GTA Pokemon (___________) Any Names. Thank you And i hope you like my game. Any Ideas would be appreciated. Vabbè,soprassediamo sulla qualità...comunque la car mode è una figata,manca solo un sonoro "Chack" e poi per me è completo! Fatemi capire... devo andare in giro a sparare ai pokèmon? O_O Poi magari porto il Crack ai capopalestra e finalmente posso anche portarmi "IN GIRO" l'infermiera del pokèmon center???? O_O ... Infermiera? Hum, excuse me but, why did you take without my permission, the screenshoot i Made for ? Whys not listed as a source, i only give my homebrew and my autorisation to us ? Why i can't find any link to my website ? For the image ok, we come to remove it! Ok you take the news from dsgamermaker, but it's really weird, you take screenshoot over nmax, when any link are on dsgamemaker to nmax ... don't take me for an idiot pleaz.... you must go on nmax to see and take the screenshoot, a little thank's would be appreciate. In our news you won't EVER find any link to any website apart from the website of the developer. The news, as someone as already told you, has been taken from dsgamermaker. We have also change our image to avoid any other discussion with you because we are full of your complaining: why don't you discuss about the Henry's hand foul instead of boring us trying to have some backlinking that you'll never have? Adieu (and not Au revoir as Cantona used to say in a famous tv spot). Sai che IDIOT è corretto si? ragazzi,x farlo funzionare basta metterlo nella R4??? Si lo scarichi e poi lo metti nella tua flash card che puo essere anche r4. Dentro il file .rar c' è solo il file .nds, quindi direi di si. Passando sopra ai Pokemon li ammazzi. Finito. ma che cosa c'è di speciale? che bisogna fare? Per ora diciamo che l'homebrew è ancora vuoto, penso che l'idea dell'autore fosse quella di utilizzare i personaggi di pokemon in una storia simile a quella di GTA, cioè andare in giro ad ammazzare pokemon, ma come altri homebrew credo che non terminerà mai la sua idea. a me non lo scarica xke??????? ?